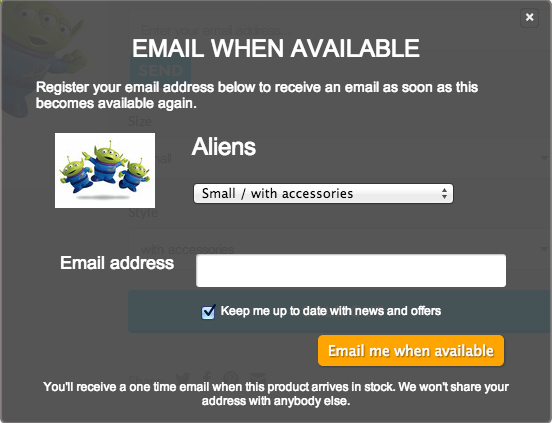 The Back in Stock registration form appears on the product page overlay (also called popup or lightbox). You can customize the styles used in the form by adding custom from the widget appearance settings page. Custom styles are applied after the default styles. This means you can choose to only add the styles you want to customize. To help create your own styles you might like to take a look at the default form styles. In this example you’ll set the form submit button to green. Take a look at the default button styles. The background is currently set to orange. By adding some custom CSS your new style will be added after the default and override the rule you specify. Add the following style to the Custom CSS field in widget appearance. Hit Save and reload the product page. Your Email when available button should now appear in a deep shade of green. Notice the text is still white as the default styles are still in place. Any Custom CSS you add in the widget appearance settings are applied only to the Back in Stock registration form. This ensure they don’t cause any conflict with your store theme.